Russian Prime Minister Vladimir Putin has condemned the Nazi-Soviet pact signed a week before Germany's 1939 invasion of Poland as "immoral". In a piece for the Polish paper Gazeta Wyborcza, he also expressed sorrow over the massacre of Polish army officers by Soviet forces at Katyn in 1940. His words are seen as a bid to ease tensions with Poland over World War II. But he also argued the Munich agreement signed by France and Britain wrecked efforts to build an anti-Nazi alliance. Mr Putin is among several statesmen attending a service in the Polish port city of Gdansk on Tuesday to mark the 70th anniversary of Poland's invasion. "Our duty is to remove the burden of distrust and prejudice left from the past in Polish-Russian relations," said Mr Putin in the article, which was also published on the Russian government website. "Our duty... is to turn the page and start to write a new one." Memories of the 1939 pact - in which the Soviet Union and Nazi Germany essentially agreed to carve up Poland and the Baltic States between them - have long soured Moscow's relations with Poland and other east European states. Within a month of the pact being signed, Soviet troops had invaded and occupied parts of eastern Poland. 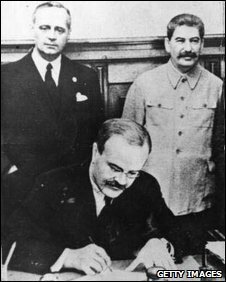 "It is possible to condemn - and with good reason - the Molotov-Ribbentrop pact concluded in August 1939," wrote Mr Putin, referring to the two foreign ministers who signed the pact at the Kremlin. It was clear today, he said, that any form of agreement with the Nazi regime was "unacceptable from the moral point of view and had no chance of being realised". "But after all," he added, "a year earlier France and England signed a well-known agreement with Hitler in Munich, destroying all hope for the creation of a joint front for the fight against fascism." The Munich Agreement of September 1938, widely seen as the low point of British Prime Minister Neville Chamberlain's policy of appeasement, allowed Germany to annex Czechoslovakia's Sudetenland region. Mr Putin added that Russian people understood "all too well the acute emotions of Poles in connection with Katyn". In 1940 Soviet secret police massacred more than 21,000 army officers and intellectuals on Stalin's direct orders in the Katyn forest near the city of Smolensk. Moscow only took responsibility for the killings in 1990, having previously blamed the massacre on the Nazis.